Partly cloudy skies. High 58F. Winds ENE at 10 to 15 mph..
Dave Bald Eagle, Christopher Sweeney and Richard Ray Whitman star in "Neither Wolf Nor Dog." A special showing of the film takes place at NOVA Center for the Performing Arts at 6:30 p.m. on Saturday, April 13. 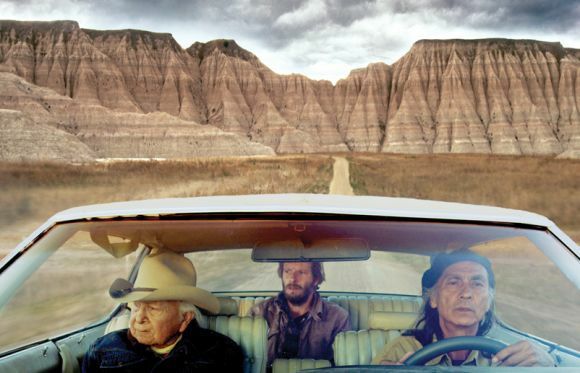 It follows the plot of a white author who gets pulled into the heart of contemporary Native American life in the sparse lands of the Dakota's by a 95-year-old Lakota elder and his side-kick. The film features a stunning, landmark performance from Dave Bald Eagle, who died shortly after the filming at age 97. Paperback books are among the titles for sale this week at the Friends of the Library used book sale at the Billings Public Library. International bestselling author Elizabeth Gilbert is giving a keynote address at FAB Women’s Conference at Sheridan College on Friday, April 12, speaking to attendees about leading a creative life. Gilbert wrote a draft of her bestselling memoir, "Eat, Pray, Love" while a resident at Ucross Foundation in 2004. The conference, presented annually by the Sheridan Press, is dedicated to recognizing and empowering woman in the Mountain West through a slate of speakers, educational seminars, and more. Tickets and more information is are available at thesheridanpress.com/fab. Music Ensemble of Audio Technology (M.E.A.T.) with special guest Erik Olson, a Billings jazz musician, will perform during the Prism concert on Saturday at Whitney Center for the Arts in Sheridan, Wyoming. The unique, multi-sensory concert will showcase different musical styles performed by a variety of Sheridan College ensembles, including the Sheridan College Chamber Choir and the Sheridan College Flute Choir. Anne Foster will present “Alcohol, Corsets, & the Vote: A Conversation with Mary Long Alderman” during an April 16 lunch and learn at Red Lodge Carnegie Library. The annual K-8 Student Art Show at the Carbon County Art Guild & Depot Gallery in Red Lodge is on display until April 27, celebrating the creativity of student artists from Belfry, Bridger, Fromberg, Fishtail, Joliet, Luther, Nye, Red Lodge and Roberts Schools. Artwork created by home school students will also be on display. A reception takes place Saturday, April 13, from 2 - 4 p.m. Pictured is Sean Spencer's "Art Tools." A tintype of Confederates in Montana territory will be part of the discussion "Confederates in Montana Territory: In the Shadow of Price's Army" with author and historian Ken Robison on place April 18 at the Western Heritage Center. Sheila Ruble, author of “Fire Pony,” will read, discuss and sign her novel at an April 13 book launch at This House of Books. The annual Northwest College Multicultural Showcase will take place April 13 at the DeWitt Student Center in Powell, Wyoming. The event, which features food from 24 countries, a silent auction, booths, exhibits and live entertainment, benefits student travel opportunities. Admission is free. Andrew Koval, left, and his son Arvid check out a 1968 Pontiac Bonneville during the Mexican Fiesta and Car Show in 2016 at South Park. Nature and ecology writer Gary Ferguson will present a keynote speech at the Montana State University Billings Research and Creativity Conference. The keynote is held Friday at Petro Theater at 12:45 p.m. The Yellowstone County Museum, located near the entrance to the Billings airport, is celebrating 65 years of preserving, protecting, and interpreting the natural history and diverse cultures of the Yellowstone Valley and the Northern Plains. The museum includes the McCormick Cabin, originally home to a pioneer family in Billings. It was transported to its present location in 1954 and opened to the public as a museum in 1956. Located along the Rims at 1950 Airport Terminal Circle, across from the Billings Logan International Airport, the cabin serves as the entrance into the expanded museum. An open house, free and open to the public, will take place Saturday, April 20 from 1 - 5 p.m.
Kelsey Bushard, left as Pomona, and William Shields as Vertumnus, rehearse for Metamorphoses at NOVA Center for the Performing Arts in Billings, Mont. on Thursday, March 21, 2019. Brian Ganz, regarded internationally as one of the leading pianists of his generation, is the featured musician at The Billings Symphony Orchestra & Chorale “Beethoven & Brahms” concert at the Alberta Bair Theater on April 13. The concert is the BSO&C’s season finale. Author event: 5:30 p.m. This House of Books, 224 N. Broadway. Roger Dunsmore reads from his recently published book of a lifetime of poems, leads discussion with Q&A. Free. 534-1133, thishouseofbooks.com. Benefit rummage sale: 8 a.m.-5 p.m. Parking lot at Evangelical Methodist Church, 345 Broadwater Ave. All proceeds benefit Broadwater Elementary’s Backpack Program and Senior High’s food pantry. Call for writers, Big Snowy Prize: Montana Quarterly annual contest for ages 30 and younger, as of April 15, 2019. Email a Word document of unpublished work up to 3,500 words to editor@themontanaquarterly.com. Limit one entry per person. Winners in each category receive $500 each. Deadline April 15. Information at themontanaquarterly.com/big-snowy-prize. Fiesta Car Show registration: For information about the annual Fiesta Car Show at South Park on July 20, call Jay Krug at 628-8872, Char Krug at 698-2851, Jamie Krug at 855-3569, or email mexicanfiestacarshow@hotmail.com. Friends of Billings Public Library Spring Used Book Sale: Public library, 510 N. Broadway. 10 a.m.-4:30 p.m.
Montana State University Billings Research and Creativity Conference: MSUB. Keynote address by Gary Ferguson, nature and ecology writer at Petro Theater 12:45 p.m. Student presentations in Glacier Room at Academic Center follow. Ice cream social 3:30 p.m. Msubillings.edu. Mother's Day Show: 10 a.m.-6 p.m. Missouri room, Red Lion Hotel, 5500 Midland Road. Crafts, antiques, collectibles, small-business booths. Free admission. Yellowstone Historical Society dinner: Elks Lodge, 934 Lewis Ave. Dinner 6 p.m. Free program 6:45-8 p.m. John Pulasky, former instructor of aviation/airway management and operations at RMC, discusses challenges and successes of careers the program has impacted. For dinner reservations, call or text 281-3223. Funky Bunch improv comedy: 7:30 p.m. NOVA Center for the Performing Arts, 2317 Montana Ave. $8. 591-9535, novabillings.org. Play "The Curious Incident of the Dog in the Night-Time": Doors 7 p.m. Curtain 7:30 p.m. Billings Studio Theatre, 1500 Rimrock Road. $20 adults; $18 seniors, students, military. Tickets at box office and billingsstudiotheatre.com. Play “Metamorphoses”: 7:30 p.m. NOVA Center for the Performing Arts, 2317 Montana Ave. Youth production. $16 adults; $10 seniors, military, students. 591-9535, novabillings.org. Rimrock Opera Kids Chorus (R.O.C.K.) Spring Showcase: 4 p.m. NOVA Center for the Performing Arts, 2317 Montana Ave. Donations accepted to support NOVA Conservatory classes for youth. 406-591-9535. Red Lodge: Call for artists. Red Lodge Clay Center. "Juried National V." Application deadline May 1. $35 entry fee, up to three entries. 446-3993, Redlodgeclaycenter.com. Red Lodge: Red Lodge Clay Center short- and long-term residencies. Application deadline May 1. Redlodgeclaycenter.com. Livingston: Craft Beer Week. Events at venues around town through April 13. Details, schedule at tapintomt.com. Livingston: Soapbox derby kick-off. 6-9 p.m. The Buckhorn. Live Calcutta auction to bid on teams. Cars on display, drivers present. Benefits Creek to Peak Foundation and Montana Matriarch. Creektopeakwear.com/derby. Norris: The Road Agents. 7 p.m. Norris Hot Springs. 406-685-3303, norrishotsprings.com. Red Lodge: Jackson Holte. 6:30 p.m. The Pollard Pub. Sheridan, Wyo. : Play “Five Women Wearing the Same Dress.” 7:30 p.m. Mars Black Box, WYO Theater. Presented by Sheridan College Theater Department. $15 adults, $10 seniors and military; $5 students. At box office and wyotheater.com. Spring Craft Fair: 9 a.m.-3 p.m. New Hope Church of the Nazarene, 25 Hilltop Road. Film screening: "Neither Wolf Nor Dog," at NOVA Center for the Performing Arts. Tickets avaliable at www.novabillings.org. 406-591-9535. Bird Stroll: 8:30-10 a.m. Montana Audubon Center, 7026 S. Billings Blvd. Walk by river. Binoculars, guidebooks available. No registration required. $10 adults, $5 children and students, free for members. 294-5099, mtaudubon.org/center. Book launch: 1 p.m. This House of Books, 224 N. Broadway. Sheila Ruble, “Fire Pony,” young adult/children's novel. Reading, discussion, signing. Free. 534-1133, thishouseofbooks.com. Friends of Billings Public Library Spring Used Book Sale: 9 a.m.-4 p.m. Public library, 510 N. Broadway. Night at the Northern: Northern Hotel, 19 N. Broadway. Steak dinner, no-host bar, live and silent auctions, live music by The Cimarron Band. $45 individual, $425 table of 8. Benefits Independent Elementary School's PTA. Revel: Dinner with wine pairings, in-event surprises ($75), After Dark party ($30) includes dancing, DJ Benefit and DJ MK. Benefits Billings Depot. Billingsdepot.org. Workshop, bat house-building: 10:30 a.m.-12:30 p.m. Montana Audubon Center, 7026 South Billings Blvd. Bring cordless drill, if possible. Registration required. 294-5099, mtaudubon.org/center. Billings Symphony Orchestra & Chorale's "Beethoven & Brahms": 7:30 p.m. (Concert Cues 6:45 p.m.) Alberta Bair Theater, 2801 Third Ave. N. 252-3610, billingssymphony.org. Youth Conservatory showcase: 7 p.m. Featuring three short productions at NOVA Center for the Performing Arts, 2317 Montana Ave. Donations accepted. 406-591-9535. Red Lodge: Family ceramics class "Mother's Day." 10:30 a.m.-noon. Red Lodge Clay Center. All ages welcome. Ages 5 and younger must be accompanied by adult. $15 per child or adult. Registration required: 446-3993. Redlodgeclaycenter.com. Red Lodge: Opening reception, “K-8 Student Art Show.” 2-4 p.m. Carbon County Art Guild & Depot Gallery. Awards 3 p.m. Exhibit featuring works by students from Belfry, Bridger, Fromberg, Fishtail, Joliet, Luther, Nye, Red Lodge and Roberts schools including home school, through April 27. Free. 406-446-1370, carboncountydepotgallery.org. Sidney: Digital photography workshop series. 1-4 p.m. MonDak Heritage Center. Weekly through April 20. Lanae King, a visiting artist with a MFA in Photography. Participants must provide own camera/phone. All skill levels. Ages 8 and older. Children must be accompanied by an adult. $30 members, $35 nonmembers. 406-433-3500, mondakheritagecenter.org. Joliet: Rebekah Craft & Garage Sale. 9 a.m.-3 p.m. Main Street. Lunch available 11 a.m.-1 p.m.
Livingston: Brew Fest. 3-8 p.m. Miles Park. Events include Art on Tap, Beer Pairing Dinners, Yoga at the Brewery, Beer Trivia, Beer & Cheese Pairings. Soapbox derby at Meyers Lane 10 a.m.-3 p.m. $30 advance, $35 day of event; $100 VIP. Proceeds benefit Creek to Peak Foundation and Montana Matriarch. Tickets, full schedule at tapintomontana.com. Powell, Wyo. : Northwest College Multicultural Showcase. 1-3:30 p.m. DeWitt Student Center. Food; silent auction; booths; exhibits; performances including traditional sword dance from Saudi Arabia, karate demonstration from Japan, song and dance from Turkmenistan. Free admission; tickets for food samples cost $3 each or $10 for five. (Students with NWC ID receive five free food tickets.) Proceeds benefit the NWC Student Travel Endowment to provide travel opportunities to a wider range of students. Nwcollege.edu. Red Lodge: Carbon County USA auction. 6-8:30 p.m. Elks Lodge. With live video conference with Gary Burghoff, aka Radar from “MASH.” Auction items include many autographed Burghoff items, destination baskets, art work by Kevin Redstar, John Potter and Dana Zier, concert and sports tickets, jewelry, restaurant gift cards, more. Benefits Roberts Veterans Project, Operation Second Chance and Yellow Ribbon program. Red Lodge: Spring farmers market. 10 a.m.-4 p.m. Roosevelt Center. Norris: Tom Kirwan. 7 p.m. Norris Hot Springs. 406-685-3303, norrishotsprings.com. Red Lodge: Kalyn Beasely. 3 p.m. The Bierstube. Red Lodge: Lee Calvin. 6:30 p.m. The Pollard Pub. Sheridan, Wyo. : Prism concert. 2 p.m. Sheridan College. Multi-sensory concert featuring Sheridan College Chamber Choir, Flute Choir and Music Ensemble of Audio Technology (M.E.A.T.) with special guest Erik Olson. Free. 307-675-0360, whitneyarts.org. Sheridan, Wyo. : Play “Five Women Wearing the Same Dress.” 2 p.m. Mars Black Box, WYO Theater. Presented by Sheridan College Theater Department. $15 adults, $10 seniors and military; $5 students. At box office and wyotheater.com. Sam & Judy McDonald Foundation Free Day: 10 a.m.-5 p.m. Yellowstone Art Museum, 401 N. 27th St. Free admission for all visitors. 256-6804, artmuseum.org. Mother's Day Show: 10 a.m.-3 p.m. Missouri room, Red Lion Hotel, 5500 Midland Road. Crafts, antiques, collectibles, small-business booths. Free admission. Billings Community Band: 3 p.m. Alberta Bair Theater, 2801 Third Ave. N. Featuring Sweet Grass County High School's symphonic band. ABT "Reminiscing Reception" follows. Ticket stubs entered for a chance to win a pair of tickets to ABT’s Opening Night in 2020 (must be present to win). $8 adults, $5 ages 18 and younger. 252-3610, billingssymphony.org. Auditions, play “Indecent” by Paula Vogel: 4:30 p.m. Mazevo, 819 Grand Ave. Bring song to sing with CD (classical, folk, country, traditional religious music preferred). Be prepared to read. Parts also available for actors who can play variety of instruments. Backyard Theatre performances June-July. Information: backyardtheatermt@gmail.com or 239-3947. Play "The Curious Incident of the Dog in the Night-Time": Doors 1:30 p.m. Curtain 2 p.m. Billings Studio Theatre, 1500 Rimrock Road. $20 adults; $18 seniors, students, military. Tickets at box office and billingsstudiotheatre.com. Play “Metamorphoses”: 2 p.m. NOVA Center for the Performing Arts, 2317 Montana Ave. Youth production. $16 adults; $10 seniors, military, students. 591-9535, novabillings.org. Bridger: Zier Gallery holiday hours. "Tweetily Dee Bird Show," with a special display of wool felted Easter chicks, sheep, and a variety of birds is on display. Through April 27, special holiday hours are 10 a.m. to 3 p.m. Zier Gallery and Perkatory Tea Curiosity Shop will be closed Friday-Saturday, April 19-20. Regular business hours resume on April 30. Virgina City: Program “Furs and Skulls and Porcupines.” 2 p.m. Elling House Arts and Humanities Center. Jim DeBoer, retired Montana Game Warden, of Sheridan, presents hands-on program about fur-bearing animals of the region and short video about porcupines. 406-843-5507, info@ellinghouse.org. Norris: Cole and the Thornes. 7 p.m. Norris Hot Springs. 406-685-3303, norrishotsprings.com. Red Lodge: Acoustic jam. 1-4 p.m. Honey's Café. Red Lodge: Lee & Charlie. 3 p.m. The Bierstube. Senior thesis exhibit “Rouche Jaune: The Lure of Elk River”: Student Gallery, Liberal Arts building, MSUB. Works by Kari J. Adams through Aug. 23. Reception on April 25. Free. Msubillings.edu. Powell, Wyo. : Northwest College Wind Ensemble and Concert Choir. 7 p.m. Nelson Performing Arts Auditorium. Conducted by Zach Paris, director of bands, and Brennan Baglio, coordinator of music and director of choirs. Free. Nwc.edu/events. MSU Billings Library spring lecture series: 6:30 p.m. MSUB Library room 148. The Noble Profession: Contextualizing recent teacher strikes and considering the profession of teaching in Montana,” with Dr. Christopher Harrison, assistant professor of educational theory and practice. Free. Msubillings.edu. Nature Nuts: 10-11 a.m. Montana Audubon Center, 7026 S. Billings Blvd. Weekly program with varying themes for ages 1-4, with adult accompaniment. $6 per child, free for members. 294-5099, mtaudubon.org/center. Opera 101 class “Blowden Backstage”: NOVA Center for the Performing Arts, 2317 Montana Ave. Third class in three-part series. Study guide available online at rimrockoperafoundation.org/performance/Blodwen.html. $15 single class, includes invitation to dress rehearsal May 8. Registration: 591-9535 or novabillings.org. Red Lodge: Lunch and Learn. Red Lodge Carnegie Library. Lunch ($5) noon, program 12:30. Anne Foster presents “Alcohol, Corsets, & the Vote: A Conversation with Mary Long Alderman.” Free. Reservations appreciated: 446-1905, hopeshomemade@gmail.com. Program “To Pluto and Beyond: The Journey of New Horizons”: 6:30-7:30 p.m. Public library community room. Shirley Greene, NASA ambassador, discusses the spacecraft that has traveled to Pluto and past Ultima Thule, a Kuiper Belt object. Free. 657-8258. Powell, Wyo. : Author discussion. 7 p.m. Nelson Performing Arts Auditorium, Northwest College. Terry Tempest Williams, award-winning author and conservationist, discusses her latest book, The Hour of Land: A Personal Topography of America’s National Parks.” After a short reading, Williams will be joined by moderator Eric Atkinson, assistant professor of biology at NWC, to share insight into her work and advocacy for public lands. Free. Nwc.edu/events. Montana: High, Wide and Handsome Series: Noon. Western Heritage Center, 2822 Montana Ave. “Confederates in Montana Territory: In the Shadow of Price's Army" with Ken Robison, historian at Overholser Historical Research Center. Free. 256-6809, ywhc.org. Poetry jam: 7 p.m. Kirks' Grocery, 2920 Minnesota Ave. No advance registration required. 503-209-2394. Norris: Todd Green. 7 p.m. Norris Hot Springs. 406-685-3303, norrishotsprings.com.